There are many specialty tubular products designed for special applications requiring unique manufacturing methods for production. Examples are the rifled boiler tube, the finned heat-exchanger tube, the duplex tube, and the double-wall tube. The rifled boiler tube (Fig. 1) is used to provide an improved heat transfer surface on the inner surface of a boiler tube. The rifling twist, similar to that of a rifle, is produced by specially shaped mandrels over which the tube is drawn. The finned heat exchanger (Fig. 2) tube provides improvement in thermal efficiency by providing an extended surface from the base tube surface. The extended surface is produced by turning the tube through special sets of dies which raise fins from part of the base tube material. These fins can be coarse or fine depending on the equipment developed for producing fins. Duplex or composite tubes have been developed to provide a different material on the inside and outside of the tube to meet the requirements of a different environment on either side of the tube. One method of producing a composite tube is by providing a bimetal mother tube before the extrusion or drawing process. Careful development of this process will yield a composite tube with an excellent bond between the two materials. Double-wall tubes (Fig. 3) are used in applications requiring leak detection to avoid a catastrophic mixture of the fluids on either side of the tube. An inert detecting gas can be placed in the annulus between the two tubes to sense very small amounts of leakage from either tube so as to allow careful shutdown of the system. This tube is manufactured by inserting one tube inside the other, then drawing the combined tube through dies or over mandrels which provide a calibrated prestress between the two tubes. 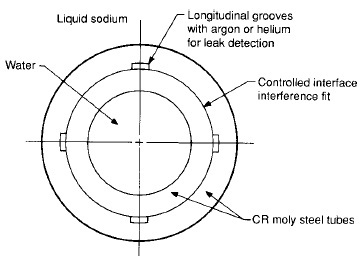 This type of tube was developed for application to a fast breeder reactor sodium-water steam generator. The selection of the appropriate pipe manufacturing method by the design engineering specification deserves consideration. For many applications, the codes and standards specified in the procurement contract provide for little room to select an optimal manufacturing method. The safest procedure is to obtain the price and schedule from suppliers before firming the piping specifications. At times the selection of the pipe with the best manufacturing process might be tempered by project cost or delivery considerations. In such cases, much is required of the engineer to consider whether lesser quality will be able to meet the desired reliability standard. It therefore is essential that the engineer is aware of the alternates and their operating history of success and failure before an appropriate alternative decision can be accepted. It must also be recognized that choices based on economic considerations alone may prove to be the more costly in the face of the downtime costs of failure. I didn't know that there are many different types of tubular products. It's a good thing that you discussed all these different types for a better understanding of these products. These different tubular products are also used for different applications. Which is the most commonly used tubular product among these products?